even you have zero balance. 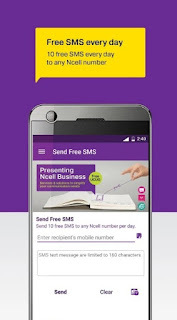 First of all you have to download Ncell app from play store and register your number in app and send daily free 10 sms. Find tariff rates for Roaming destination and activate the service. Calculate data plans based on your usage. Free data charges after download except using Ncell Store Locator map and redirected pages.